Keeping your pet safe on Halloween is a lot like keeping your kids safe on Halloween. It’s all about making sure that they have bright clothes and costumes so that they can be seen by after dark: It making sure that they don’t eat things that will make them sick. Well OK, well, it’s a little more than that! Here are a few things that you may not have thought about. Doorbell anxiety is a very common issue among dogs. Almost every dog will bark and become agitated when it hears the doorbell or someone knocking at the door. You can help your dog by desensitizing it to these sounds. But because this event only happens for a few hours, once a year, most people just feel that it is easier to have someone watch the door for trick-or-treater and limit the dog’s access to the door for these few hours on Halloween night. Another reason to limit your dog’s access to the door is that with it opening and closing all evening, your dog may sneak outside to join in all of the fun. If he gets into the street he may get hurt … or worse. Next, keep any pumpkins that contain candles up and out of the reach of pets. This will help to avoid any potential harm to your pet or to your home. All that it takes is one swish of the tail to knock a pumpkin over and you could have a real problem. If you have cats, you may want to consider using electric or battery powered bulbs to avoid accidents. As we mentioned on Tuesday, candy is dangerous to your pets. Keep candy out of the reach of your “always hungry” pets. They don’t know any better! If you plan to dress your dog in costume this year, make sure that the costume you choose is lightweight and that it does not interfere with vision, hearing, breathing or movement. But avoid loose or dangling items on the costume. They can present a wide variety of dangers to your pet. 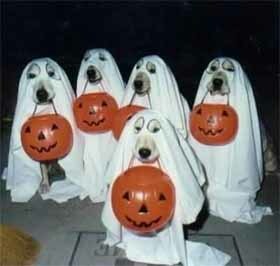 As always, if you take your dog trick-or-treating this year, make sure your pet is on a leash at all times. Even if your dog is in a brightly colored costume it can still be very hard to see at dusk or at night. As with small children, use reflective items to make them more visible. Reflective leashes, collars or stickers are available for your dog’s costume and they are a great way to help your pet be seen at night. Lastly, don’t leave your dog outside unattended. Your yard may normally be quite safe, but Halloween pranksters and vandals can get carried away and your pet may suffer for it. There have been several news articles in recent weeks, were dogs were targeted by some sick people who (baited) gave dogs access to poisoned food and food with sharp objects inside of it. Even if your dog is big enough to take care of itself, don’t take any chances. After all, if your dog hurts someone, even if they are trespassing or committing a crime, you can be held legally liable for their injuries. Keep everyone safe; keep your pets inside with you.